North Carolina and South Carolina will receive millions in federal funds to repair damaged infrastructure left in Hurricane Florence’s wake. The U.S. Department of Transportation is granting North Carolina $14 million and South Carolina $8 million. DOT announced in a press release issued Sept. 20 that the Federal Highway Administration will make these “quick release” emergency relief funds available for North Carolina immediately. Transportation Secretary Elaine Chao approved the $8 million for South Carolina in a phone call with Gov. Henry McMaster on Sept. 21. The funds will be used to restore access to essential roads and bridges battered by the storm. 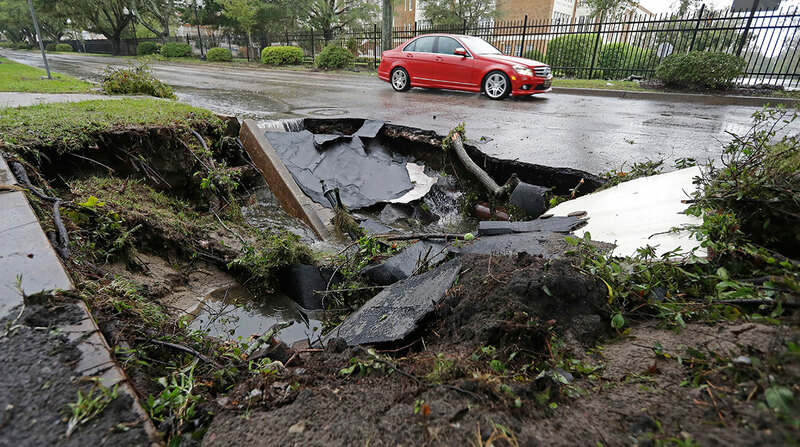 Florence inundated parts of the Carolinas, leaving about 3 feet of rain in some places. Many areas still are submerged. FHWA’s emergency relief program offers funding for highways and bridges that have been struck by natural disasters or catastrophic events. The funds will help restore basic traffic routes and prevent further highway damage, which can ease long-term recovery efforts. DOT approved the funds shortly after Gov. Roy Cooper and North Carolina Transportation Secretary James Trogdon requested them. Flooding rendered hundreds of eastern North Carolina roads impassable, including portions of interstates 95 and 40. Segments of these roadways still are drenched, and North Carolina Department of Transportation officials are directing freight and passenger traffic to alternate routes, such as interstates 540 and 85 and U.S. routes 64 and 321. Matthew Hendrix, senior director of fleet services at Fleet Advantage, told Transport Topics that bottlenecks on arterial roads can cause a one-hour drive to last three hours, stalling movement for passenger vehicles and freight haulers alike. According to a Sept. 23 announcement, Cooper told residents to exercise caution as they return home amid receding floodwaters. As of that date, road closures throughout North Carolina dropped below 500, down from more than 1,600. Road access in Wilmington, the coastal city 50 miles north of the South Carolina border that was shuttered by the storm, has reopened in some areas, and municipal buildings resumed operations Sept. 24. Wilmington is home to a major port that specializes in grains, wood products and chemicals. The port resumed operations Sept. 18 with restrictions that confine activity to daylight hours. DOT’s release said that the damage wrought by Florence exceeded the state’s budget for emergencies. The federal funds will reimburse NCDOT for its expenses related to emergency traffic operations and use of state forces to repair damaged roads. Almost exactly one year ago, DOT announced another round of quick-release emergency relief funds. Those were directed to road and bridge restoration in Puerto Rico, which had been devastated by Hurricane Maria. That storm made landfall Sept. 20, 2017, resulting in power outages that affected millions of people.